Mini-invasive Surg 2017;1:121-5.10.20517/2574-1225.2017.23© The Author(s) 2017. 1Department of Surgery, Escola Paulista de Medicina, Federal University of São Paulo, São Paulo, SP 04037-003, Brazil. 2Department of Surgery, University of North Carolina at Chapel Hill, Chapel Hill, NC 27599, USA. Achalasia is a rare neurodegenerative primary esophageal motor disorder characterized by abnormal lower esophageal sphincter relaxation and aperistalsis. The disease may be idiopathic or secondary to Chagas’ disease - a tropical disease common in Latin America, although both forms have distinct etiology they share the same pathophysiology. End-stage disease with marked esophageal dilatation or sigmoid-shaped esophagus is; however, more frequent in Chagas’ disease patients [Figure 1]. The degree of esophageal dilatation is used to grade the severity of the disease and may be used as a guide to tailor treatment according to some authors. There is no consensus on the threshold of esophageal diameter to consider the disease as end-stage. While some adopt the limit in 6 cm, others prefer 7 cm. In Brazil, 4 different stages of esophageal dilatation are considered and end-stage disease is defined by diameterover 10 cm. Laparoscopic Heller’s myotomy (LHM) is the most common surgical procedure to treat achalasia. It is the most accepted therapy for non-advanced stages of the disease. In the setting of advanced disease with marked esophageal dilatation or sigmoid-shaped esophagus the ideal surgical procedure is debatable. Esophagectomy is believed by several authors to be the operation of choice in these cases. However, others advocate for less invasive alternatives. This review discusses the role of LHM as the preferred treatment for achalasia irrespective of the degree of esophageal dilatation. LHM was described in the early 1990s[12,13] and since became a wildly accepted procedure for non-advanced achalasia. Forceful pneumatic dilatation of the cardia is also a widespread primary therapy but recent meta-analyses showed inferior results to dilatation as compared to LHM[10,16]. Indeed, a shift to LHM to endoscopic dilatation has occurred. LHM is associated to low rates of complications, null mortality, and excellent and long-lasting outcomes superior to 90% of dysphagia relief in most series[18-20]. LHM is still the gold-standard treatment for non-advanced achalasia that must be used to compare the outcomes of other treatments such as the newly developed peroral endoscopic myotomy (POEM)[21,22]. Esophageal dilatation is more frequent in Chagas’ disease esophagopathy compared to idiopathic achalasia with esophageal diameter over 10 cm found from 10% to 37% of the cases. This observation may explain the lack of international literature on the treatment for massive dilated esophagi. Moreover, end-stage achalasia is defined by esophageal dilatation superior to 10 cm in Brazil, thus esophagi between 6-10 cm will not be defined as advanced in the Brazilian series and will probably undergo a LHM. Esophageal resection is the procedure historically established for end-stage achalasia in Latin America as well as globally[11,23-27]. The number of esophagectomies for the treatment of achalasia has been decreasing after the 1990s in favor of less invasive methods since esophagectomy is associated with significant complications and mortality. Moreover, surgical risk is directly linked to the degree of esophageal dilatation. Minimally invasive techniques decreased morbidity although they are still especially considering achalasia is a benign disease. Other conservative surgical techniques were tried to minimize complications, such as cardioplasty + gastrectomy (Holt and Large procedure, known in Brazil as Serra-Dória operation[32-34]), esophageal mucosectomy and endomuscular gastric tube reconstruction and laparoscopic cardioplasty[36,37]. Long term results for these procedures in a significant number of patients are lacking. Few series evaluated the results of LHM for the treatment of end-stage achalasia [Table 1]. Some advocate LHM as the primary option for advanced diseases based on the idea that an esophagectomy could be avoided. Others believe that a massive and tortuous esophagus does not empty well if only the obstacle at the esophagogastric junction is alleviated[45-47] and found worse results for LHM when the esophagus is dilated[48,49]. There are no prospective comparative studies comparing LHM with other techniques for end-stage achalasia. Some authors show similar outcomes (complications and dysphagia control) for LHM irrespective of the degree of esophageal dilatation[9,38,42,45]. In general, excellent results may be obtained from 54-100% of the cases, with an average of almost 80% [Table 1]. LHM is not more demanding in patients with massive dilated esophagus. A careful dissection of the mediastinal esophagus allows a straightening of the axis of the organ facilitating esophageal emptying[42,44]. Finally, LHM does not preclude a subsequent reoperation with a different technique. Recurrent dysphagia after LHM may be treated by endoscopic dilatation, POEM[50,51], redo LHM, cardioplasty with or without gastrectomy[33,34,36], or esophagectomy[10,50]. If a bigger operation is needed, the patient would need a better overall clinical and nutritional status. LHM is a valuable therapy for advanced achalasia although data comes from retrospective case series. The procedure is associated with a low rate of complications and good/excellent results in the majority of patients. LHM is not technically more demanding and it does not preclude a subsequent reoperation with a different technique if necessary. 1. Richter JE. Achalasia - an update. J Neurogastroenterol Motil 2010;16:232-42. 2. Petersen RP, Martin AV, Pellegrini CA, Oelschlager BK. Synopsis of investigations into proposed theories on the etiology of achalasia. Dis Esophagus 2012;25:305-10. 3. Vicentine FP, Herbella FA, Allaix ME, Silva LC, Patti MG. Comparison of idiopathic achalasia and Chagas' disease esophagopathy at the light of high-resolution manometry. Dis Esophagus 2014;27:128-33. 4. Herbella FA, Oliveira DR, Del Grande JC. Are idiopathic and Chagasic achalasia two different diseases? Dig Dis Sci 2004;49:353-60. 5. De Rezende J, Lauar KM, de Oliveira A. 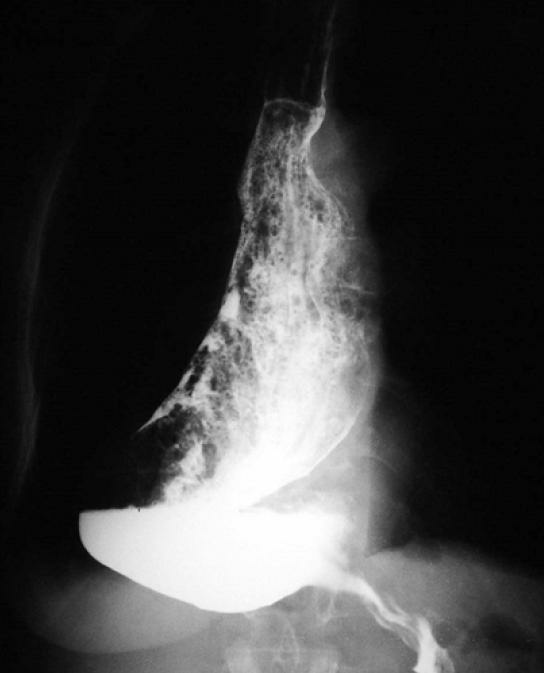 Clinical and radiological aspects of aperistalsis of the esophagus. Rev Bras Gastroenterol 1960;12:247-62. 6. Patti MG, Feo CV, Diener U, Tamburini A, Arcerito M, Safadi B, Way LW. Laparoscopic Heller myotomy relieves dysphagia in achalasia when the esophagus is dilated. Surg Endosc 1999;13:843-7. 7. Onopriev VI, Durleshter VM, Ryabchun VV. Comparative pre- and postoperative results analysis of functional state of the esophagus assessment in patients with various stages of achalasia. Eur J Cardiothorac Surg 2005;28:1-6. 8. Ferreira-Santos R. Aperistalsis of the esophagus and colon (megaesophagus and megacolon) etiologically related to Chagas' disease. Am J Dig Dis 1961;6:700-26. 9. Pantanali CA, Herbella FA, Henry MA, Mattos Farah JF, Patti MG. Laparoscopic Heller myotomy and fundoplication in patients with Chagas' disease achalasia and massively dilated esophagus. Am Surg 2013;79:72-5. 10. Yaghoobi M, Mayrand S, Martel M, Roshan-Afshar I, Bijarchi R, Barkun A. Laparoscopic Heller's myotomy versus pneumatic dilation in the treatment of idiopathic achalasia: a meta-analysis of randomized, controlled trials. Gastrointest Endosc 2013;78:468-75. 11. Watson TJ. Esophagectomy for end-stage achalasia. World J Surg 2015;39:1634-41. 12. Shimi S, Nathanson LK, Cuschieri A. Laparoscopic cardiomyotomy for achalasia. J R Coll Surg Edinb 1991;36:152-4. 13. Pellegrini C, Wetter LA, Patti M, Leichter R, Mussan G, Mori T, Bernstein G, Way L. Thoracoscopic esophagomyotomy. Initial experience with a new approach for the treatment of achalasia. Ann Surg 1992;216:291-6; discussion 296-9. 14. Patti MG, Fisichella PM, Perretta S, Galvani C, Gorodner MV, Robinson T, Way LW. Impact of minimally invasive surgery on the treatment of esophageal achalasia: a decade of change. J Am Coll Surg 2003;196:698-703; discussion 703-5. 15. Spechler SJ. Pneumatic dilation and laparoscopic Heller's myotomy equally effective for achalasia. N Engl J Med 2011;364:1868-70. 16. Campos GM, Vittinghoff E, Rabl C, Takata M, Gadenstätter M, Lin F, Ciovica R. Endoscopic and surgical treatments for achalasia: a systematic review and meta-analysis. Ann Surg 2009;249:45-57. 17. Allaix ME, Herbella FA, Patti MG. The evolution of the treatment of esophageal achalasia: a look at the last two decades. Updates Surg 2012;64:161-5. 18. Costantini M, Zaninotto G, Guirroli E, Rizzetto C, Portale G, Ruol A, Nicoletti L, Ancona E. The laparoscopic Heller-Dor operation remains an effective treatment for esophageal achalasia at a minimum 6-year follow-up. Surg Endosc 2005;19:345-51. 19. Herbella FA, Aquino JL, Stefani-Nakano S, Artifon EL, Sakai P, Crema E, Andreollo NA, Lopes LR, de Castro Pochini C, Corsi PR, Gagliardi D, Del Grande JC. Treatment of achalasia: lessons learned with Chagas' disease. Dis Esophagus 2008;21:461-7. 20. Niebisch S, Fleming FJ, Galey KM, Wilshire CL, Jones CE, Litle VR, Watson TJ, Peters JH. Perioperative risk of laparoscopic fundoplication: safer than previously reported-analysis of the American college of surgeons national surgical quality improvement program 2005 to 2009. J Am Coll Surg 2012;215:61-8; discussion 68-9. 21. DeMeester SR. Per-oral endoscopic myotomy for achalasia. J Thorac Dis 2017;9:S130-4. 22. Awaiz A, Yunus RM, Khan S, Memon B, Memon MA. Systematic review and meta-analysis of perioperative outcomes of peroral endoscopic myotomy (POEM) and laparoscopic heller myotomy (LHM) for achalasia. Surg Laparosc Endosc Percutan Tech 2017;27:123-31. 23. Ferreira EA. Subtotal esophagoplasty by combined cervico-abdominal route: its possible use in megaesophagus. Rev Paul Med 1973;82:133-4. 24. Pinotti HW, Zilberstein B, Pollara W, Raia A. Esophagectomy without thoracotomy. Surg Gynecol Obstet 1981;152:344-6. 25. Banbury MK, Rice TW, Goldblum JR, Clark SB, Baker ME, Richter JE, Rybicki LA, Blackstone EH. Esophagectomy with gastric reconstruction for achalasia. J Thorac Cardiovasc Surg 1999;117:1077-84. 26. Sader AA. Esophagectomy with gastric reconstruction for achalasia. J Thorac Cardiovasc Surg 2000;119:194-5. 27. Orringer MB, Marshall B, Iannettoni MD. Transhiatal esophagectomy: clinical experience and refinements. Ann Surg 1999;230:392-400; discussion 400-3. 28. Ceneviva R, Ferreira-Santos R, Santos JS, Mente ED, Sankarankutty AK. Chronological changes of patients profile and of surgical treatment modality of the chagasic megaesophagus. Acta Cir Bras 2002;17:125-8. 29. Felix VN. Esophagectomy for end-stage achalasia. Ann N Y Acad Sci 2016;1381:92-7. 30. Neto JG, de Cleva R, Zilberstein B, Gama-Rodrigues JJ. Surgical risk for patients with Chagasic achalasia and its correlation with the degree of esophageal dilation. World J Gastroenterol 2005;11:5840-4. 31. Schuchert MJ, Luketich JD, Fernando HC. Complications of minimally invasive esophagectomy. Semin Thorac Cardiovasc Surg 2004;16:133-41. 32. Holt CJ, Large AM. Surgical management of reflux esophagitis. Ann Surg 1961;153:555-62. 33. Stefani-Nakano SM, Faintuch J, Rocha JM, Gama-Rodrigues JJ, Cecconello I. Quality of life of patients operated for advanced Chagas' megaesophagus. ABCD Arq Bras Cir Dig 2005;18:129-32. 34. Ponciano H, Cecconello I, Alves L, Ferreira BD, Gama-Rodrigues J. Cardiaplasty and Roux-en-Y partial gastrectomy (Serra-Dória procedure) for reoperation of achalasia. Arq Gastroenterol 2004;41:155-61. 35. Aquino JLB, Reis Neto JA, Muraro CLPM, Camargo JGT. Esophageal mucosectomy in the treatment of the advanced megaesophagus: analysis of 60 cases. Rev Col Bras Cir 2000;27:109-16. 36. Dehn TC, Slater M, Trudgill NJ, Safranek PM, Booth MI. Laparoscopic stapled cardioplasty for failed treatment of achalasia. Br J Surg 2012;99:1242-5. 37. Griffiths EA, Devitt PG, Jamieson GG, Myers JC, Thompson SK. Laparoscopic stapled cardioplasty for end-stage achalasia. J Gastrointest Surg 2013;17:997-1001. 38. Herbella FA, Del Grande JC, Lourenço LG, Mansur NS, Haddad CM. Late results of Heller operation and fundoplication for the treatment of the megaesophagus: analysis of 83 cases. Rev Assoc Med Bras (1992) 1999;45:317-22. 39. Faccani E, Mattioli S, Lugaresi ML, Di Simone MP, Bartalena T, Pilotti V. Improving the surgery for sigmoid achalasia: long-term results of a technical detail. Eur J Cardiothorac Surg 2007;32:827-33. 40. Mineo TC, Pompeo E. Long-term outcome of Heller myotomy in achalasic sigmoid esophagus. J Thorac Cardiovasc Surg 2004;128:402-7. 41. Gaissert HA, Lin N, Wain JC, Fankhauser G, Wright CD, Mathisen DJ. Transthoracic Heller myotomy for esophageal achalasia: analysis of long-term results. Ann Thorac Surg 2006;81:2044-9. 42. Sweet MP, Nipomnick I, Gasper WJ, Bagatelos K, Ostroff JW, Fisichella PM, Way LW, Patti MG. The outcome of laparoscopic Heller myotomy for achalasia is not influenced by the degree of esophageal dilatation. J Gastrointest Surg 2008;12:159-65. 43. Scott PD, Harold KL, Heniford BT, Jaroszewski DE. Results of laparoscopic Heller myotomy for extreme megaesophagus: an alternative to esophagectomy. Surg Laparosc Endosc Percutan Tech 2009;19:198-200. 44. Schuchert MJ, Luketich JD, Landreneau RJ, Kilic A, Wang Y, Alvelo-Rivera M, Christie NA, Gilbert S, Pennathur A. Minimally invasive surgical treatment of sigmoidal esophagus in achalasia. J Gastrointest Surg 2009;13:1029-35; discussion 1035-6. 45. Herbella FA, Patti MG. Laparoscopic Heller myotomy and fundoplication in patients with end-stage achalasia. World J Surg 2015;39:1631-3. 46. Peters JH, Kauer WK, Crookes PF, Ireland AP, Bremner CG, DeMeester TR. Esophageal resection with colon interposition for end-stage achalasia. Arch Surg 1995;130:632-6; discussion 636-7. 47. Devaney EJ, Lannettoni MD, Orringer MB, Marshall B. Esophagectomy for achalasia: patient selection and clinical experience. Ann Thorac Surg 2001;72:854-8. 48. Mattioli S, Ruffato A, Lugaresi M, Pilotti V, Aramini B, D'Ovidio F. Long-term results of the Heller-Dor operation with intraoperative manometry for the treatment of esophageal achalasia. J Thorac Cardiovasc Surg 2010;140:962-9. 49. Zaninotto G, Costantini M, Rizzetto C, Zanatta L, Guirroli E, Portale G, Nicoletti L, Cavallin F, Battaglia G, Ruol A, Ancona E. Four hundred laparoscopic myotomies for esophageal achalasia: a single centre experience. Ann Surg 2008;248:986-93. 50. Patti MG, Allaix ME. Recurrent symptoms after Heller myotomy for achalasia: evaluation and treatment. World J Surg 2015;39:1625-30. 51. Ngamruengphong S, Inoue H, Ujiki MB, Patel LY, Bapaye A, Desai PN, Dorwat S, Nakamura J, Hata Y, Balassone V, Onimaru M, Ponchon T, Pioche M, Roman S, Rivory J, Mion F, Garros A, Draganov PV, Perbtani Y, Abbas A, Pannu D, Yang D, Perretta S, Romanelli J, Desilets D, Hayee B, Haji A, Hajiyeva G, Ismail A, Chen YI, Bukhari M, Haito-Chavez Y, Kumbhari V, Saxena P, Talbot M, Chiu PW, Yip HC, Wong VW, Hernaez R, Maselli R, Repici A, Khashab MA. Efficacy and safety of peroral endoscopic myotomy for treatment of achalasia after failed heller myotomy. Clin Gastroenterol Hepatol 2017; doi: 10.1016/j.cgh.2017.01.031.